﻿ Wish Upton A Star Socks - $12.00 : Bruised Boutique, For Derby. By Derby. See a shooting star, close your eyes and make a wish. Did it come true yet?! OK, our shipping isn't THAT fast, but we know you wished for these knee high socks! All your dreams can come true. 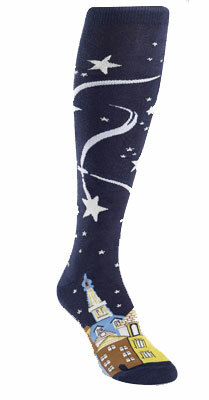 The majesty of the night sky can now hug your calves like a starry blanket. Hurry! Wish for something else, like a tiger who can fly and is also your best friend. Or maybe just a second pair.